Hydrographics printing is an at-home printing process that will transfer a design from a film onto any hard surface that can safely be submerged underwater. This incredible process creates amazing decorative patterns and images on ATVs, trucks, cars, motorcycles, sporting goods, electronics, hunting equipment, firearms, housing décor and anything else you can imagine. Never done hydrographic printing before? Don't worry - Our products are some of best on the market. You won't get any of the problems that you could face with inferior films, like creasing or bunching up. 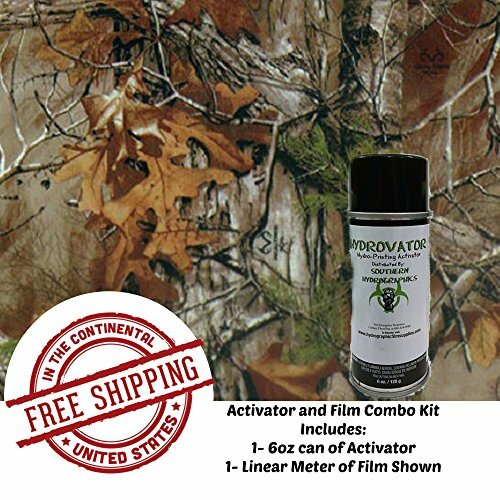 The activator we sell works great with our films, We provide easy to follow instructions that helps anyone new to the hydrographic process. You'll be delighted with the results, no matter which object you choose to print. We're confident that you'll be delighted with this hydrographic film. After extensive testing, we believe it's the highest quality kit on the market today. If you don't agree, for any reason at all, then simply let us know and we'll be happy to give you a full and immediate refund. We're taking on all the risk, so you can try this kit risk free. You'll be glad you did. Get The Best Hydrographic Film On The Market - Accept No Substitutes - Pick Up This "Autumn Dip Kit" today! Don't forget to check out our Complete Line of Hydrographics Paints, Primers, Clear Coats and Activators Today!!!!! We offer a variety of Film options in multiple sizes! We carry Hydro dip Film in Flames, Skulls, Carbons, Camouflage, Animal Skins, Cartoons, Flags and many more!!! We offer Hydrographics Film Activator hydro dip Film Kits, as well as Full hydro dip Kits that include everything you need for a successful dip! Check out everything we have to offer! Search all of Southern Hydrographics Film supplies today!!! Our hydrographics film are made using superior inks and a high definition manufacturing process, to create crisp images with vivid colors. Easy to Use Graphics for Hydrographics Also Known as Water Transfer Printing - 1 Meter 19" x 38" and 1 6oz Can Activator kit. We Recommend the use of Our Hydrographics Base Coats & Clear Coats and Primers. Designed for the Hydro Dipping Process! !